Decorative Frames. 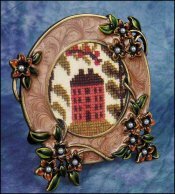 2 Round Cocoa Floral Enamel Frame  - $9.00 : Yarn Tree, Your wholesale source for cross stitch supplies. Item 4555. Amber enamel flowers with white 'pearl' centers accent the cocoa swirled enamel background. Design area is 1 7/8" diameter. Comes with an easel back and is individually boxed. Design is not included, but comes from #G6570 Around the Robin's Nest from By the Bay Needleart.